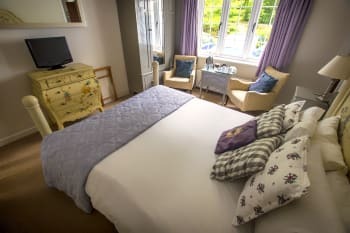 Wayside Cottage is a beautiful wysteria-covered Edwardian cottage in the New Forest village of Burley offering six traditional, uniquely decorated, en-suite bedrooms. 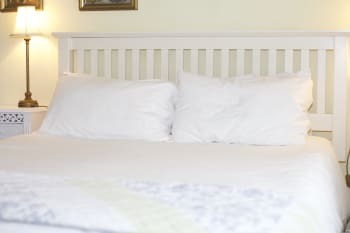 Beds are big and comfortable with twin, king or super kingsize beds & crisp linen. 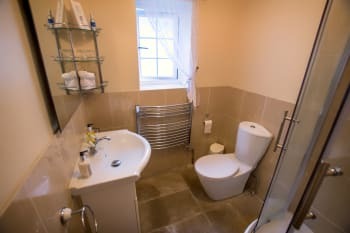 All bedrooms are en suite with showers or over bath showers, fluffy towels & delicious bathroom products. Outside there is a pretty courtyard with tables and chairs or benches in the well kept front garden, where you can relax, read a book. Inside the house there is a guest lounge with complimentary tea, coffee and filtered water on offer all day & freshly baked cakes & biscuits for afternoon tea. 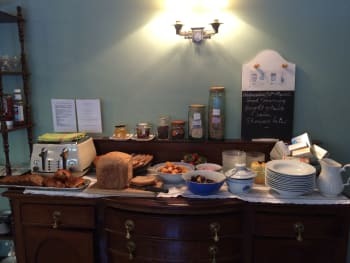 Our bountiful breakfasts will give you a well fed start to the day.We bake our own bread & yoghurt and make our own jam. All our produce is sourced locally. The New Forest is a short 200 yard stroll from the front door, offering endless opportunities for all interest. Wayside Cottage is a quiet haven only a few minutes walk to the nearest pub. There are no rooms available at Wayside Cottage for these dates. Lovely people and brilliant food and great ambience! This is our third visit to Wayside Cottage and have always been made to feel very welcome by Trish and her Husband. Great Accommodation, great food would recommend a visit. Friendly, comfortably, quiet location with helpful,excellent management and staff. Excellent choices for breakfast with afternoon tea provided if wanted. We will be back! Good location within walking distance of pubs restaurants etc. Our welcome was wonderful and we were made at home right away. I loved the guest lounge it is rare to find one, and having drinks and cake was great. The only down side was the bar, I was looking forward to a glass of white wine but there was none to be found. The bike ride along the old railway line was fantastic do it if you can. We went to the owl and reptile centre which was also good. Both the pubs in Burley are good for food and drink and I loved the welcome the kids were given everywhere we went. Had a very enjoyable stay and were made most welcome. Breakfast's were fantastic. Would not recommend the Queens Head Pub service and food very poor. The Burley Inn was slightly better. 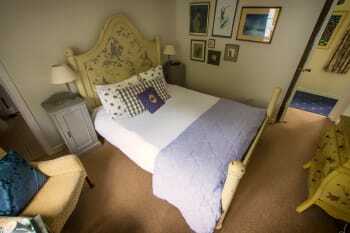 We are frequent visitors to Burley and have stayed at many of the B&Bs and hotels in the village. Wayside Cottage is by far the best! Thank you Lindsay and Jackie for your continued support (and kind words). We always enjoy your visits and look forward to seeing you in 2018. We had a very friendly welcome from Trish and our stay was exceptional. The room was quiet, comfortable and immaculate and the choice at breakfast was excellent. Wayside Cottage is a short stroll to the village where there are shops, cafes and pubs. A stay here is definitely recommended. 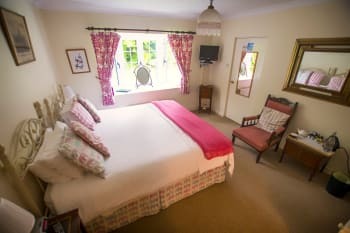 I have stayed at a lot of hotels and bed and breakfasts which have all been very nice, but I have to say Wayside cottage is a truly special place nothing too much trouble and the breakfasts well I have never had such a wonderful breakfast you can tell everything is done from the heart. Just wonderful. All had a nice meal at Burley Inn which I believe is under new management. Our room was adequate for one or two nights but not four as the wardrobe was very small and had to move the chair to access it. I feel the furniture could be updated as drawers were a bit rickety but the bed was lovely and comfortable. There was some mould on the tiles in the shower which didn't look appealing but the shower was clean. Nice little touches with lovely shampoo and shower gel and sewing kit, cotton wool ,cleanser pads and shower cap etc Would definitely return but would request different room. Lovely breakfasts and the owner Trish very friendly. Burley village is lovely , restaurants a short drive away particularly Brockenhurst . Would recommend The Huntsman , lovely food and service, also Carpenters Arms Bransgore. Das Badezimmer schimmelt und im ganzen Haus sind Renovierungsarbeiten notwendig. Abgesehen davon alles super! Tolles Frühstück mit selbstgebackenem Brot und allem was das Herz begehrt. Top Standort: Mehrere Pubs zu Fuß erreichbar. A lovely friendly b&b Trish made us very welcome In her home. An amazing place to stay with a warm welcome and friendly staff. Make sure you don't eat for a few days before to make room for the biggest and tastiest breakfasts ever! 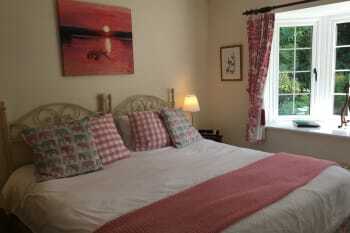 A wonderful stay in a lovely cottage with all home comforts. Trish could not have been more welcoming and helpful.The breakfasts were delicious with lots of choice. The afternoon tea and home made cake was a really nice bonus,would return tomorrow. A really warm and friendly environment. Totally relaxing and congenial. Food is out of this world! A very good choice for a short break. Beware pot holes in the unmade-up approach road. Could seriously damage your car. If you like driving, go across the moors for fantastic views. Superb lunch and dinner can be found at the Hare and Hounds in Sway at very reasonable prices. Beautiful B&B with incredibly friendly hosts. Loved our stay and hope to return. We were made to feel very welcome with our 8 week old twins and Trish was so kind in providing us with facilities to make our stay easier. Super nice stay with wonderful host. We will be back, very pleasant! Dear Alison, We are sorry to hear your stay at Wayside Cottage was unsatifactory in so many way. The emails are generated directly, by the electronic system which we introduced to avoid over bookings, which have been a problem in the past. The system simply uses the name initially input in the booking. Our apologies. As for the confusion re taking payment. It is our policy to take payment only on departure, and in the moment (which can be busy, at breakfast time), we simply forgot that you had paid previously. I do believe we apologised profusely when our error was pointed out to us by yourselves and indeed you had paid previously. Interesting that you recommend Wayside Cottage to other travelers. I hope this means that your stay was not entirely without satisfaction. Always a warm welcome from Trish and Ian. 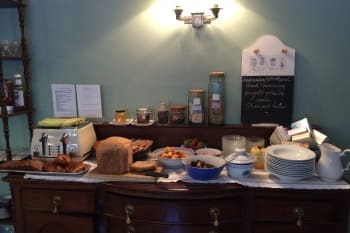 Good breakfast selection and the lovely homebakes, tea and coffee available in the sitting room every day are a very nice treat. Our favourite B & B. Highly recommend. Plenty to see and do in the New Forest - you can be as busy or laid back as you choose. Very friendly, helpful locals who will if asked recommend places to vist, places to eat etc. Made very welcome, lovely choice of homemade items for breakfast. Friendly staff who were informative about the area and helpful with ad hoc requests. Lovely extra touches included cake at teatime and an outside seating area in which to eat it! Very close to the centre of the village but extremely quiet at night. Friendly hosts and a real 'home from home.' Fresh home baked cakes each day at 4pm. Will definitely be back. Great local pubs with good food - The Three Tuns at Bransgore and the White Buck at Burley. wonderful, personal welcome and attention to detail. Fabulous breakfast in delightful dining room. Quiet and very relaxing. Very helpful and friendly hostess. 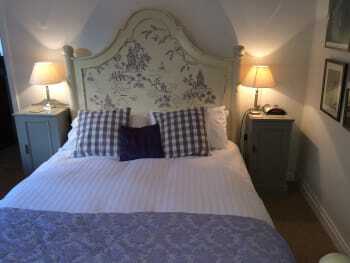 Very comfortable place to stay with the local pubs and village shops within a few minutes walk. The rooms are clean and of a reasonable size. There is tea and coffee make facilitaties available in the bedrooms as well as the sitting room which you can use at anytime of the day. The breakfasts were excellent with plenty of choices to accommodate all tastes. We were made to feel very welcome by the very friendly staff and we will definitely be going back again. The cottage is really lovely and so is the breakfast. The lady who owns it was very nice and couldn't do enough for us. Lovely location. Peaceful tranquil oasis. Room excellent, clean and well furnished with nice view of the garden. Lounge area cozy and gardens restful. Best of all though was the breakfast. Superb flavour, choice and huge. You definitely won't need to interrupt the rest of your day for a lunch! !Very helpful owner with excellent local knowledge. Will return!! Several pubs and eateries serving good evening food close by. Easy direct access to pleasant forest walks. Bike hire 5 minutes away. The BEST B&B we've stayed in by a mile! 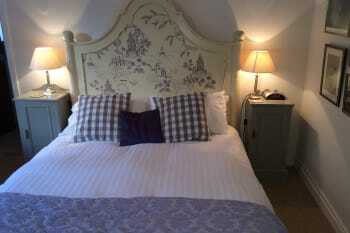 Lovely room, fabulous breakfasts, and extremely amiable hostess and staff. Thank you Trish and Rosie, we'll certainly be back! HIGHLY recommended. Local Burley art Exhibition good, Avon Beach at Muddyford excellent,, Christchurch worth a visit. This was our second stay here with friends and as before everything was just great. Perfectly situated for the men in our party to do a bike ride in the Forest. Very close to the village and local pubs. We ate at the Burley Inn both nights and would recommend it. Breakfast in the garden was lovely and the supply of coffee and cake in the afternoon was very welcome. Great bike hire shop in village. Burley is a small village, so some forward planning on things to do would be an advantage, but there is two pubs were you can eat & drink. Visit the cider pantry for some lunch, you will not be disappoinnted. Fantastic situation right in the heart of the New Forest. Very welcoming and informative about local restaurants and attractions, facilities etc. The location is quiet but very close to the village. Particularly enjoyed afternoon tea and cake in the garden. There are two pubs which serve food within a few minutes walk from the cottage, and The White Buck which is a lovely stroll by the golf course and through part of the forest where there are usually ponies grazing. Beautiful setting and excellent breakfast, very homely. Beautiful place in a lovely quiet location. The room was very nice and the bed was so comfortable. The breakfast choice is amazing and cooked to perfection. Trish is very friendly and helpful and provides those extra touches such as complimentary tea and coffee and freshly baked cake every day. We would not hesitate to stay again and cannot recommend this place highly enough. Peace and quiet location ideal place for round and about attractions, Trish has a excellent knowledge of dietary requirements Breakfast was the best with so much choice my favourite was the fruit & pancackes with cream & maple syrup my husbands favourite being the gluten free breakfast, Trish also made gluten free biscuits, flapjacks, muffins and bread nothing was too much trouble, our room was lovely over looking the beautiful front garden with a very comfy four poster bed with drinking facilities and TV. We loved our stay. Our stay at Wayside Cottage was superb. Food at breakfast excellent with good choice of dishes. Lovely quiet location. Beautiful house and gardens. Trish, aided by assistant Rosie, looked after our every need. Thoroughly recommend. Good local eateries for dinner were The Burley Inn in the village and The Three Tuns in Bransgore. We found the B and B most welcoming and we really appreciated the advice regarding eating places and the booking of a table for us. Breakfast was truly superb with many homemade items with other elements locally sourced. Eating those breakfasts outside on the patio will be memorable for a long time. Trish recommended the white Buck to us which was about 25 minutes walk through the woods. We had an excellent meal there. I would definitely have given a 5 if the TV in our room had been slightly better ...otherwise I cannot fault you. I just wish you were a little closer to us (we live 275 miles away) and we would come to stay more often! Right on the doorstep of the New Forest, you will see wild ponies (we even saw a young foal), deer for certain, perhaps roaming cattle. Walking is a "must" do here - tale good walking boots. The local pub (we only tried one) was good pub food. There are a number of tea shops, also "trippery" stuff and a post office. There is also a nearby stable if you fancy riding and a horse-draw tour available to please the children. It is only a small village so don't expect too much...it is quite charming as it is! Enjoyable stay...shown great hospitality and given suggestions where to visit in surrounding area. Our charming room was very comfortable and clean and the generous breakfasts were great. Also you could help yourself to tea and homemade cake in the afternoon and sit on back patio. Pretty cottage set back from the village main road so noise was never an issue...great night sleeps. Enjoyed walking nearby trails in the New Forest and both nights had good pub meals at the local Burley Inn. Trish is a fantastic host - enthusiastic,friendly, and very professional. 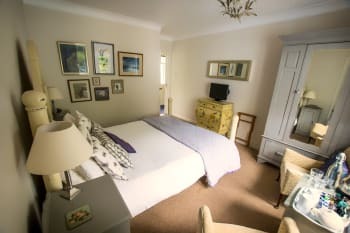 She has put a great deal of thought into all the little extras which make for a perfect stay in this very well placed B&B. This includes complimentary teas, coffees and homemade cakes every afternoon in a communal sitting room, or outside on a sunny terrace in a lovely garden.It also includes a magnificent home cooked breakfast, with fresh fruit, locally sourced produce and a wide choice of options. Definitely a B&B to return to! 5 minutes walk to 3 pubs for good standard pub food and Burley Manor - which was a very special place to eat. At the centre of a large network of magnificent cycle tracks. Wonderful place in perfect location. The breakfast is delicious and is all freshly cooked and there is home-made bread and jams. A nice touch is the home-baked cakes available in the lounge area in the afternoons. This is certainly one of the best B & B's we've been to. My second visit!! Again we had fantastic choices for breakfast - amazing! 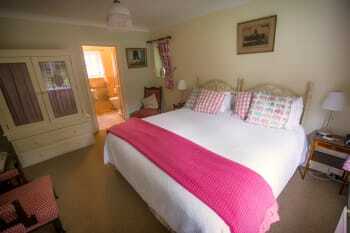 The rooms are spacious, clean and comfortable, with access to a sitting room and patio area for relaxing. Much more than just the basics on offer to guests. Everyone was helpful and informative about the area. Nothing was too much trouble. A bonus to see ponies walking past in the mornings. Would certainly recommend this B & B.
walks in forest a must, Queens Head pub in village good all round food. The Queens Head is serving good food at reasonable prices, mudeford is as always a nice place to visit. A really excellent B&B. Welcoming owners who are keen to make your stay ideal for you. Close to pubs and tea rooms and close to heathland and woodland areas. Has to be the best breakfast I've ever had. Everything cooked to order, so expect service to be slow. Beautiful house and very comfy bed. The Burley Inn and Queen's Head good food, reasonably priced. The Cider Tea Rooms do excellent lunches and cream teas. Their cakes are fantastic. Lymington, Beauleigh, Bucklers Hard, and Brockenhurst are all worth a visit. New Forest great for walkers. So many different views and aspects. One of my favourite places in the country. Very friendly. Lovely place to stay. although pleasant surroundings & décor, our room was very small as a double & lacked surface area & space to move around. We loved the total peace & quiet of the whole house & all the extra space available to us - outside courtyard, garden, lounge with snacks & drinks. Breakfast was excellent for choice , variety & quality. would have liked brown sugar option & found my smoked salmon very salty. Otherwise everyone in our party was amazed at the choices. Appreciate friendliness & detailed concern of our hosts. Cider Mill Café (& shop)at edge of Burley was a great place for lunch/snacks etc especially after a stroll in the woods & gorseland on top.had a pleasant garden & smallholding at the back to entertain kids. Would not recommend Queens for food though pub itself was ok.
Trish and Ian were exceptionally welcoming and friendly and we loved our couple of days there. Excellent breakfast and we appreciated the tea, coffee and homemade cakes in the afternoons. Perfect stay! Very convenient for cycling and walking in the New Forest. Also very close to the village and pubs etc. Warm, friendly and made us both felt welcomed. Looking forward for a return weekend break. Great area for walks cycling, short drive to the coast great location for all activities. We were warmly greeted by Tricia and Ian who showed us to a very pretty, comfortable well-appointed room. The cottage is on a quiet lane but within 100m of the village centre. There's ample private parking in the front drive. The entire inside is light and airy with many views of the lovely garden. Afternoon tea is laid out in a cosy lounge, plenty of choice of teas and coffees and homemade cakes! Breakfast is wonderful, everything you could want and too much to describe here. This is B&B at its very best. Walking, horse-riding and cycling is what you do in the New Forest and there is plenty of information so visitors have no trouble organising their days. The local cycle hire shop is staffed by helpful and knowledgeable young men. You can even hire those wonderful bikes with electric assist. There are several good tea rooms for those moments when you need light refreshments. Evening meals are well catered for. 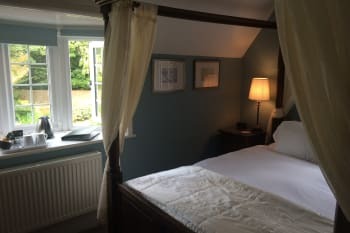 Just one minute from the B&B is the Burley Arms which serves top quality British food in very comfortable surroundings. If you're wanting to be a little more adventurous try The White Buck. It is just 20 minutes easy walking away, well worth it. 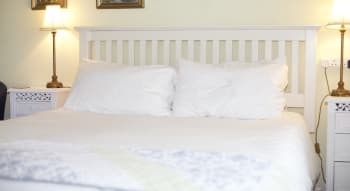 Comfy, clean accommodation - I normally struggle to sleep well when away from home but I slept like a log and I have a dust allergy but didn't sneeze even once. Breakfast was varied and delicious and Trish & Ian couldn't have been more welcoming and helpful. Really lovely stay and we'd love to come back. We really enjoyed our stay at Wayside from start to finish. We were showed to our rooms and given fantastic recommendations of some lovely places in the area. The rooms were clean and very comfortable and breakfast was delicious. Owners perfectly friendly, happy and helpful. Will most definitely recommend and have already! Very pleasant stay. Comfortable friendly and excellent breakfast. The setting was fantastic, the owners were amazing and I am sure we will be rebooking again. The room was clean and tidy and the food was delicious. Thank you from Darren and Sarah. Hire a bike and cycle through the woodland trails. Local pub served great food. Pay a visit to the local fudge shop. Good location and Ian and Trish were very welcoming. The room was very comfortable and the breakfasts were fantastic. We had great meals and drinks at the Three Tuns at Bransgore and the White Buck at Burley. Both very good pub/restaurants. we enjoyed the quietness of the surroundings and are looking forward to returning in the not too distant future. Lymington Market on a Saturday is better than most markets. 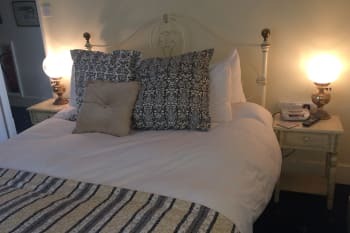 Book a stay of at least a week at Wayside Cottage - you'll need it to work through all the wonderful choices on the breakfast menu. 5 mins walk to the queens head pub,lovely good value food, great service. 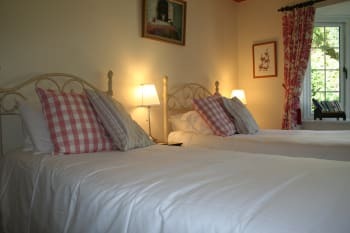 Wayside cottage is the ideal b & b in a quiet location . Ian& Trish are perfect hosts . Breakfasts are a feast & cake & cookies are available every day . We are already booked to return in August. Yvonne & John from Suffolk. The Fleur De Lys in Pilley is a lovely place to eat. One of the best welcomes ever. Pity we didn't have the appetite to take advantage of the freshly baked chocolate brownies. Very friendly and helpful owners. 'The Cider Press' is good for snacks and light meals. It is a short walk away. A lovely welcoming b n b. Clean, very comfortable, great choice of high quality food. The patrons are committed to providing a great service for their customers, and take pride in what they do. Lovely. Highly recommended. A good spot for discovering the delights of the the lovely new forest. Wayside Cottage is a Home from Home. The food is absolutely delicious and Ian and Trish are most welcoming hosts. Lovely walks in the forest and close to the sea. Relax and enjoy the hospitality. Really enjoyed our stay. Made to feel very welcome. Was really nice to have cakes in the visitors lounge! Good quality food and accommodation. Just a small thing that didn't bother us but might be helpful to you: we only had two cups and two towels in our bedroom when there were 3 of us. Would definitely stay again if we return to the area. Friendly welcoming hosts who seem to have thought of everything. Loved the home made Cakes & cookies with the included afternoon tea set up in the guest lounge. Home made bread, coissant, jams etc with breakfast. We ate in a local pub one night which did what it said on the tin. Other than that wayside was our Base to explore the south New Forest and coastal views. Recommend a visit the Highcliffe And the sandy beach. Mudeford and Barton cliff top. Views amazing. Very friendly host, breakfast is amazing, good location, made to feel at home very comfy bed. White Buck Hotel has excellent restaurant only 2 miles away. Lovely stay with fabulous service by Ian and Trish who made us feel very welcome. Lovely retreat, hosts were delightful and made us feel very welcome. Breakfast was bountiful with a lot of choice. Home made cakes were provided in the afternoon for anyone staying. Could not fault anything during our stay. Visit beaulieu national motor museum , palace house and gardens. Queens head pub, is walking distance from the house and they serve lovely food and all the staff are very welcoming. Very warm and welcoming, and a wonderful array of choices for breakfast, beautifully cooked. 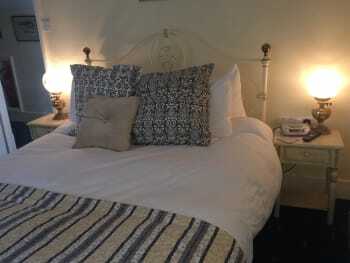 Really lovely B&B, Good location to Burley, you can walk to the two local pubs. Good comfy bed, cosy room, ecellent shower. Breakfast was good, they catered well for my odd dietary requests. Excellent selection all well cooked. Owners friendly and breakfast was great. We had a superb stay at Wayside; nothing was too much trouble for our hosts. From the warm welcome to the torches and umbrellas at the front door, everything has been thought of. There's a cosy guest lounge where Trish serves homemade cake each afternoon with complimentary hot drinks and an honesty bar. Our room was clean and bright with a huge comfy bed. A delightful village and equally delightful B&B! Fantastic bed and breakfast. The best we have ever stayed at. A big hearty breakfast every morning and the most comfy beds ever. Ian and Trish the owners go out of their way to make your stay the best it can possibly be. The cottage is only a short distance away from lots of beautiful walks in the New Forest. We cannot wait to return next year. Ps: The cottage also has excellent Wi-Fi. Many Thanks. The Queens head in Burley serves really nice pub grub. Excellent visit. Could not fault anything. A warm and welcoming home well worth the tariff. Burley Villa Western riding experience was an incredible day out. Beaulieu Motor Museum well worth a visit if you like cars. Taking a slow walking or driving meander through the New Forest. The Queens Head, in Burley, has a separate veggie/vegan menu. Dinner at The Cliff Hotel, in Barton on Sea, is a must. 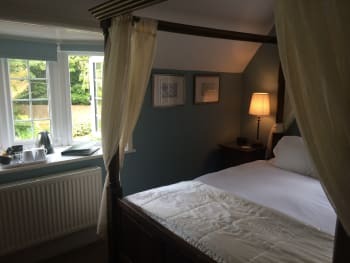 We were very warmly welcomed by the owners Ian & Trish and shown to our lovely room which was both comfortable and very spacious. In the morning our breakfast was delicious all locally sourced and beautifully presented. We were a group of 6 visiting the New Forest for a couple of days cycling. Trish and Ian welcomed us warmly giving us helpful advice on cycle routes and good refreshment stops. The rooms were very comfortable and tastefully furnished. The visitors' lounge with tea, coffee and the delicious cookies was a good gathering point for us. Trish's generous breakfast, offering an amazing range of options, set us up for the day. 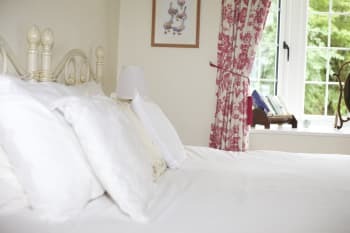 We would highly recommend Wayside Cottage. Absolutely excellent. Trish and Ian are truly wonderful and Wayside Cottage is absolutely delightful. 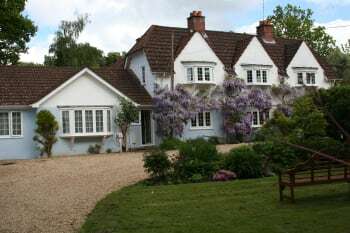 A fantastic New Forest place to stay. We had a lovely stay at Wayside Cottage. Very comfortable and welcoming. Great breakfast choices!